Monster Kid Writer, Derek M. Koch joins Kyle for a discussion of the United States’ giant monsters. There’s something magical about the old black and white Atomic Monster Movies of the 1950s. In addition to the inherent cheese factor that attracts some of us to their tales, they were the predecessors to our favorite mega monsters from Japan. Obviously without King Kong and The Beast from 20,000 Fathoms, we wouldn’t have Godzilla and his rubber suited foes. Unfortunately I don’t have a deep-seated knowledge of these films’ lore – so I thought it would behoove me to invite a guest onto the Kaijucast to talk about these American films that are related, at least tangentially to Japan’s kaiju genre. Derek M. Koch has been on the podcast before but in an abbreviated segment during one of our live shows. 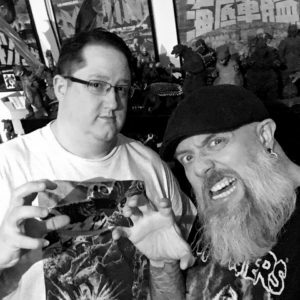 Derek runs Monster Kid Radio – another podcast all about the awesomeness of monster movies. Keep an eye out for Derek’s upcoming book Fifty Shades of Monster Movies, due out later this year! And make sure to follow what he’s doing on his website (and his writing site). Hope you enjoy the discussion, everyone – we had a blast talking about these classics! So it occurred to me that I failed to mention, during out Emergency Broadcast, that February’s Daikaiju Discussion is a special “short film” discussion. I’m tempted to push it off since today is the 19th and this is going to be the first time that any of you have heard of this, BUT since I doubt that we would have received a lot of homework in for these rare films, I think I’m keeping the discussion on the books! So if you’d like to submit your Daikaiju Discussion for the two short films Negadon: Monster from Mars (2006) AND Gehara, The Dark and Long-Haired Monster (2009), make sure you send in your thoughts, questions and reviews for these two films before February 24th to be included in the discussion.